If you thought Apple only had “i’s” for its smartphone line-up, think again. On Tuesday, the company announced that it had updated its iMac consumer desktop line, bringing new processors, improved graphics, better Wi-Fi, and enhanced storage options—all in the same thin package it introduced last October. Among the new offerings are faster quad-core Intel Core i5 processors, based on the new Haswell architecture. 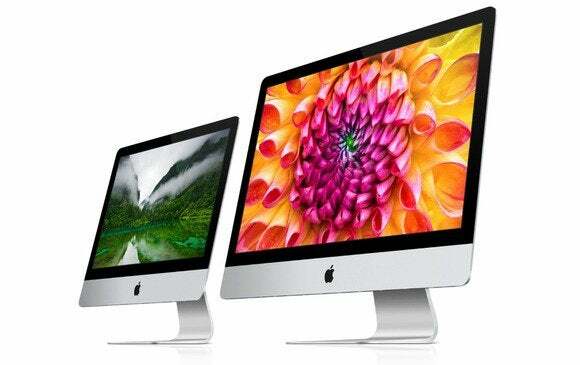 For the 21.5-inch iMacs, the two base configurations come in at 2.7GHz and 2.9GHz, respectively, while the 27-inch iMac models start at 3.2GHz and 3.4GHz. A 3.1GHz Core i7 is available as a build-to-order option on the high-end 21.5-inch model, while a 3.5GHz quad-core Core i7 is available for the high-end 27-inch model. All processors include Intel’s Turbo Boost 2.0 technology, which can automatically raise the speed of active cores without sacrificing efficiency: The 2.7GHz can be boosted to 3.2GHz, the 2.9GHz and 3.2GHz to 3.6GHz, and the 3.4GHz to 3.8GHz. The boosted graphics include the new Iris Pro integrated graphics on the low-end 21.5-inch iMac, which used to feature the Nvidia GeForce GT 640M chip. The Nvidia GeForce 700 series is available on the high-end 21.5-inch model and both 27-inch models. The Nvidia GeForce GTX 780M, which features up to 4GB of video memory, is available as a build-to-order option. All iMac models now offer 802.11ac Wi-Fi, the latest version of the wireless networking protocol that Apple first brought to the MacBook Air earlier this year. And, thanks to a recent patch in OS X 10.8.5, wireless speeds between 802.11ac-equipped Macs and the latest version of Apple’s Time Capsule are finally up to snuff. Finally, the updated iMac features PCIe-based flash storage, which Apple says boosts the speed of the hybrid Fusion Drive and pure solid-state storage options by 50 percent. There’s also now a 1TB solid-state storage option on the 27-inch model, but it’ll cost an extra $1000. $1299: 21.5-inch model with a 2.7GHz quad-core Core i5, 8GB of memory, a 5400-rpm 1TB hard drive, and Intel Iris Pro integrated graphics. $1499: 21.5-inch model with a 2.9GHz quad-core Core i5, 8GB of memory, a 5400-rpm 1TB hard drive, and Nvidia GeForce GT 750M 1GB graphics. $1799: 27-inch model with a 3.2GHz quad-core Core i5, 8GB of memory, a 7200-rpm 1TB hard drive, and Nvidia GeForce GT 755M 1GB graphics. $1999: 27-inch model with a 3.4GHz quad-core Core i5, 8GB of memory, a 7200-rpm 1TB hard drive, and Nvidia GeForce GTX 775M 2GB graphics. All four models are available beginning Tuesday. Updated at 7 a.m. Pacific to correct processors on the 27-inch models.